Broccoli Cheese Casserole is a classic comforting side dish made with whole ingredients, from scratch --- no canned soup or mayo! Chop the broccoli, including the tender stems, into bite sized pieces. Put in a glass bowl, add a tiny splash of water, and microwave for 2 minutes. Remove and drain really well. Melt the butter in a saucepan over medium heat and add the flour, stir for about a minute. Slowly pour in the milk, whisking or stirring continuously, until it thickens and just comes to a simmer. Remove from heat. Let it cool for a minute, and then stir in the cheese, then the eggs, and seasonings. 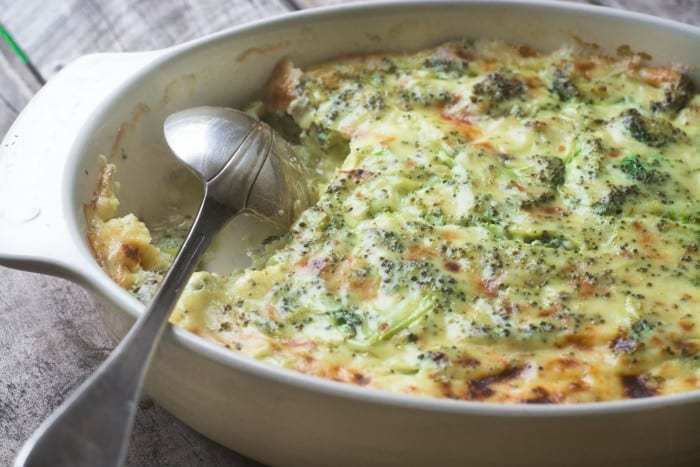 (When I add the beaten eggs I stir or whisk briskly so they don't scramble) Fold in the broccoli and turn into the casserole. Bake for about an hour, or until browned and bubbly. You can run it under the broiler for the last minute or two to brown it, if you like.